Cosmetic dentistry procedures are used to improve your smile. For many people, this gives added confidence about their appearance, and helps them to feel better about themselves. This is one of the most popular forms of cosmetic dentistry, as a whiter smile is often seen as a sign of good health and attractiveness. Teeth whitening generally takes two forms: bleaching trays (which can be done at home) or laser whitening (which is done in the surgery). Both use bleach compounds to artificially whiten your teeth. This can result in some damage to the tooth enamel and gums, and teeth will often be sensitive for a couple of days afterwards. Home bleaching kits are often the better bet for long-lasting whiteness. Laser whitening can give immediate results, but tends not to last as long. Many dental surgeries combine the two for the best results. The level of whiteness varies from person to person, but your dentist should be able to offer a guideline as to how white your teeth will be based on their condition, and the bleach compound that is being used. Veneers can transform teeth that are badly stained, broken or worn. They are bonded over existing teeth to alter their appearance. Many celebrities have had veneers fitted to give them their trademark perfect teeth. Porcelain veneers will usually last for between five and ten years, while composite veneers will need to be replaced within a few years of being fitted. Crowns can restore broken and damaged teeth. Like veneers, they are bonded onto your teeth to change how they look and feel. They are often fitted when a tooth is too decayed for a filling to be the best option. They are usually used as one of the last resorts, as a good chunk of the tooth needs to be filed down before a crown can be fitted. Dental implants are placed into a pre-drilled hole in your jaw to replace missing teeth. A crown, bridge or denture will then be fitted using this as a support. There is usually less bone loss with this procedure compared to dental bridges or dentures. Dental bridges are false teeth that are designed to replace missing teeth. They are supported by the existing teeth on either side, which are fitted with crowns so that they can provide enough support. Dentures are removable replacements for missing teeth. If only a few teeth are missing, a partial denture can be fitted, but if the majority of your teeth have come out, a full denture is necessary. They are very realistic, and resemble real teeth in both appearance and feel. Gum reshaping can be done to counteract a 'gummy smile'. Excess gum tissue is taken away by laser technology, which seals the blood vessels to limit bleeding. For extensive reshaping, you may need to have the bone on the front of the teeth trimmed to stop the gum tissue from growing back again in the future. Orthodontic work refers to teeth straightening procedures. In most cases, a brace (either fixed or removable) will be worn to reposition the teeth, followed by retainers to stop the teeth moving back into their old positions when the brace is removed. The length of time that you need to have the brace on is dependent on how complex the straightening and realigning will be. 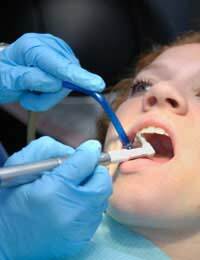 As with cosmetic surgeons, there will always be cosmetic dentists that are not reputable. If you are unlucky enough to be at the mercy of one of these, you can find yourself in a much worse state than you were in the first place. Doing your homework before you commit yourself to a specific surgery or dentist will go a long way towards avoiding this. Reputable dentists will be registered with the General Dental Council (GDC).